DnBuster's Place: The Borax - Fresh Year, Fresher Laundry Facebook Sweepstakes is LIVE! The Borax - Fresh Year, Fresher Laundry Facebook Sweepstakes is LIVE! 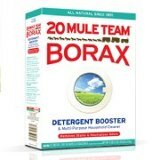 Borax is the All Natural Laundry Booster! We are eager to give them away, so make sure your readers sign up once a day until February 22nd, 2013.